The Clash Black Serrated Folding Blade goes to the dark side in the new black Clash. In addition to a drop-point blade with just the right amount of belly recurve for excellent slicing ability, the black Clash also has partial serration so that it can laugh at tough materials like webbing or rope. The blade steel is 8Cr13MoV for toughness, wear resistance, and excellent edge retention. The Clash Black Serrated Folding Blade goes to the dark side in the new black Clash. In addition to a drop-point blade with just the right amount of belly recurve for excellent slicing ability, the black Clash also has partial serration so that it can laugh at tough materials like webbing or rope. The blade steel is 8Cr13MoV for toughness, wear resistance, and excellent edge retention. The steel is precision heat-treated to bring out its high-performance characteristics. Black oxide coating enhances corrosion resistance and provides a great, non-reflective look. 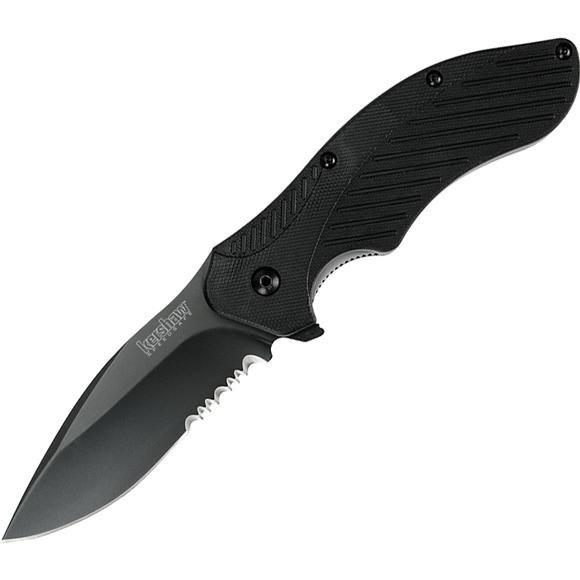 The black Clash opens with ease and authority thanks to Kershaw&apos;s SpeedSafe® assisted opening system. A simple pull back on the flipper and SpeedSafe opens the knife super-smoothly and easily. Textured glass-filled nylon handle scales offer a solid grip as the handle contours nestle securely into the hand. A locking liner locks provides a safe, secure, and solid blade lockup. As with all Kershaw knives, the Clash Black Serrated Folding Blade is built with precision and offers the fit and finish you&apos;ve come to expect from Kershaw. This Clash offers plenty of style, a multi-tasking blade shape, and the satisfaction of SpeedSafe opening in a value-priced knife.